Omega part # 471-031 6W 120V Panel Lamp for Super Chromega D and E dichroic colorheads. 75W 12V quartz-halogen reflector lamp for Leitz Focomat V35 enlargers. Equivalent to the Philips #13139 lamp. Omega part # 471-001 PH111A 75 watt 120 volt opal enlarging lamp with bayonet base for Omega enlargers. 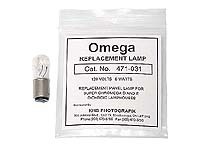 Omega part # 471-002 PH211 75watt 120volt opal enlarging lamp with screw base. Omega part # 471-038 PH140 75watt 120volt "tear-drop shaped" opal enlarging lamp with screw base. for use in the Chromega B Dichroic colorhead. Money-saving 6-pack of PH140 75watt 120volt "tear-drop shaped" opal enlarging lamp with screw base. 75 watt 120 volt opal enlarger lamp with screw base. Money-saving package of four PH211 75 watt 120 volt opal enlarger lamps with screw base. Philips PF603E/51 75 watt 220 volt opal enlarger bulb with screw base. 12-pack of Philips PF603E/51 75 watt 220 volt opal enlarging bulbs. Package of 4 Philips Photocrescenta PF603E/51 75 watt 220 volt opal enlarger bulbs.